When the City of St. Charles came to us looking for a branding redesign, we immediately jumped on board this exciting project. While the City already had an established logo and brand messaging, they knew that their logo and materials were a little disjointed and they wanted a package with a cohesive look and feel that would help strengthen their brand image both internally and within the local community. The previous logo for the City of St. Charles had several inconsistencies: different fonts were being used in different versions, “Illinois” was present in one version but not the other, and there were additional spacing and color issues as well. While these may seem like small or unimportant details, they added up to a big problem: nobody really knew what the correct logo was. And the missing “City of” in one version was starting to lead to an identity crisis within the organization. We broke the logo apart into its key elements and redesigned it in both a vertical and horizontal format that could be used across a number of applications. Each version of the logo consistently uses the same colors, fonts, wording, and other typographical elements. The City of St. Charles has many internal meetings and external presentations and needed a suite of document templates that were coordinated with the same look and feel, but that would offer enough variety for multiple uses. Working off of the approved logo and color palette, we designed a series of flexible documents that work across a number of applications. All documents were supplied as templates that the internal staff can use and edit as needed. 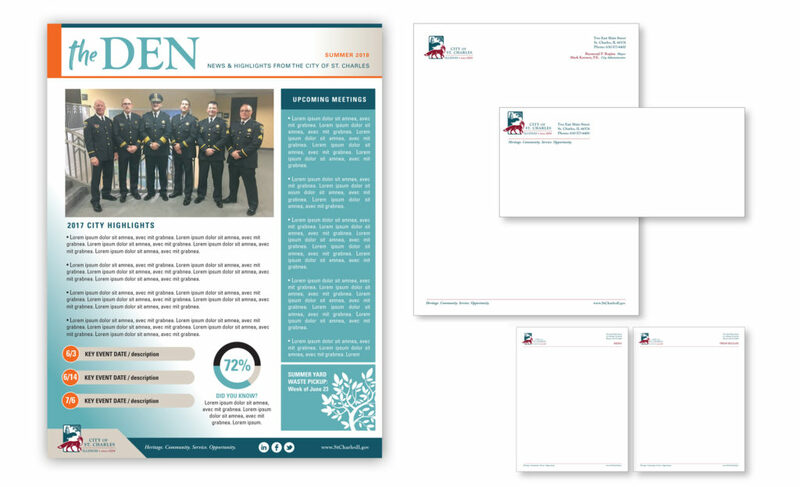 To round out the design package, we built a set of identity papers and a newsletter template that the communications team can edit on a seasonal basis.